*The following products were provided in exchange for my honest review. I'm not done with Cosmoprof goodies yet! I still have plenty to share with you. This next polish is from Girly Bits. Girly Bits is a brand that I have regretfully not purchased from in a while. The indie world can get a little overwhelming for me, but being able to try some of her polishes recently has ignited my love for the brand. I will definitely be frequenting Girly Bits again. This polish, Defying Gravity is a collaboration between Girly Bits and Phyrra to celebrate Phyrra's 7th blog anniversary. 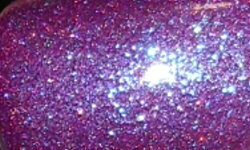 Defying Gravity is a medium purple with an intense turquoise shimmer and a touch of holo sparkle. Color: Defying Gravity is an amazing multi-dimensional color. The turquoise shimmer really stands out and flashes on your nail against the purple base. It really has such a neat effect on the nails. The holo sparkle just adds another awesome layer to this polish too. Formula: This had a great formula. It was smooth and easy to apply. I used 3 coats above. Price: This is $9.84 on the Girly Bits website. Overall: I love Defying Gravity. This is the type of nail polish that has everything in one. Sometimes when you have too much or too many of a good thing it doesn't always work out too well. This is not the case with Defying Gravity, all of the components work beautifully together to create a stunning polish!